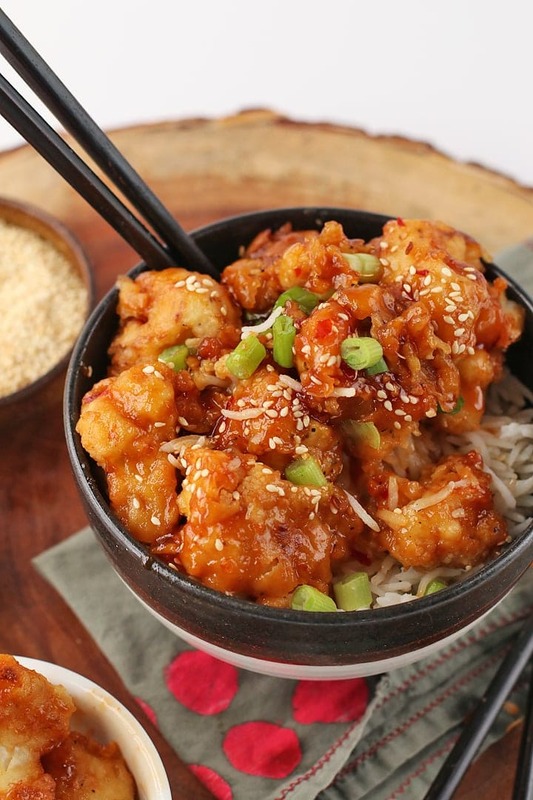 Make your own Chinese food at home with this Sticky Sesame Cauliflower with a healthy twist. 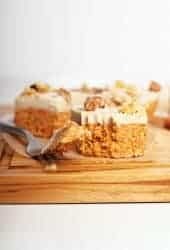 Vegan, baked, and made with no refined sugar! 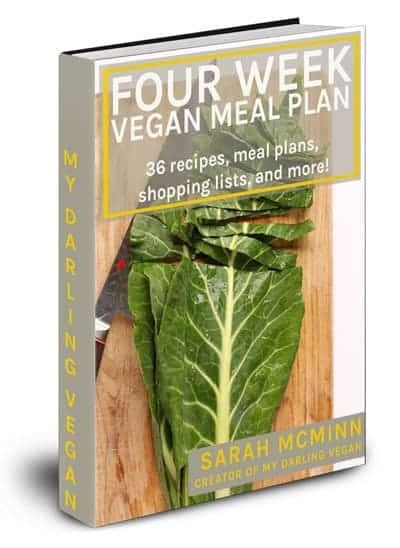 I’ve been so excited to share this recipe with you, my friends! For weeks I’ve been teasing you with pictures on Instagram #sorrynotsorry. I really couldn’t help myself. 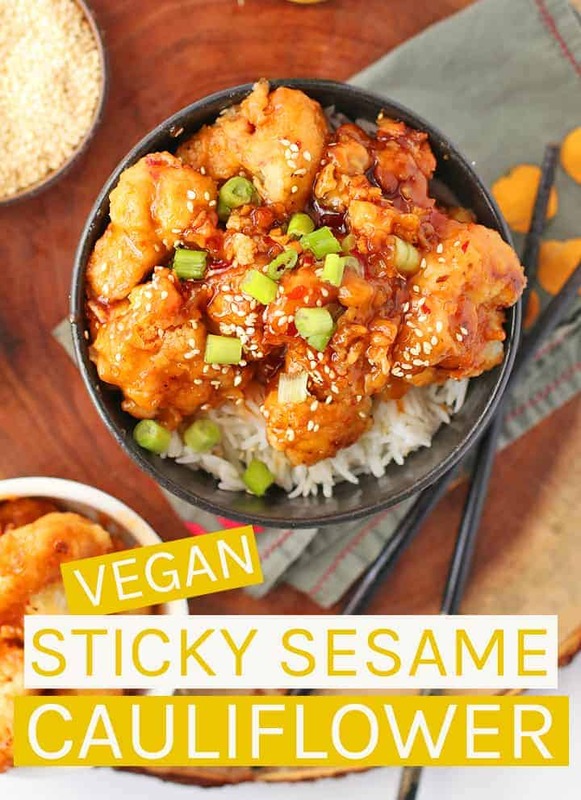 Why, it’s Sticky Sesame Cauliflower, for crying out loud! 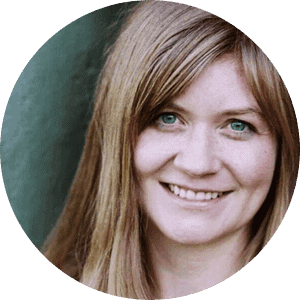 If you’re a vegan that lives on or has traveled to the West Coast, then you are probably familiar with the ever-loved vegan chain, Veggie Grill, a fast-casual restaurant that focus on bring veggies to the center of the plate. If you are unfamiliar, please check it out next time you’re visiting. 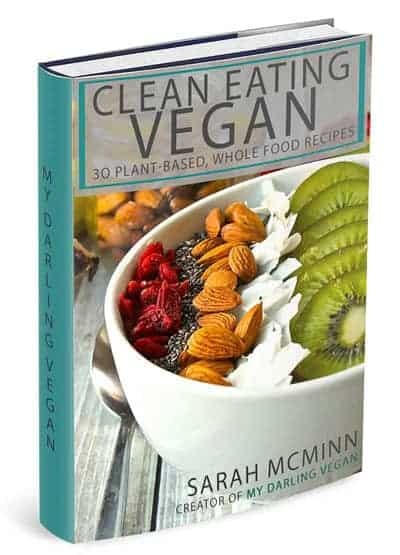 You’ll find a full vegan menu with some of your favorite comfort foods: sandwiches like Buffalo Chick’n, appetizers like Mondo Nachos, and tacos like Tres “Fish” Tacos. And I can credit Veggie Grill for first teaching me about the wonders of crispy cauliflower. 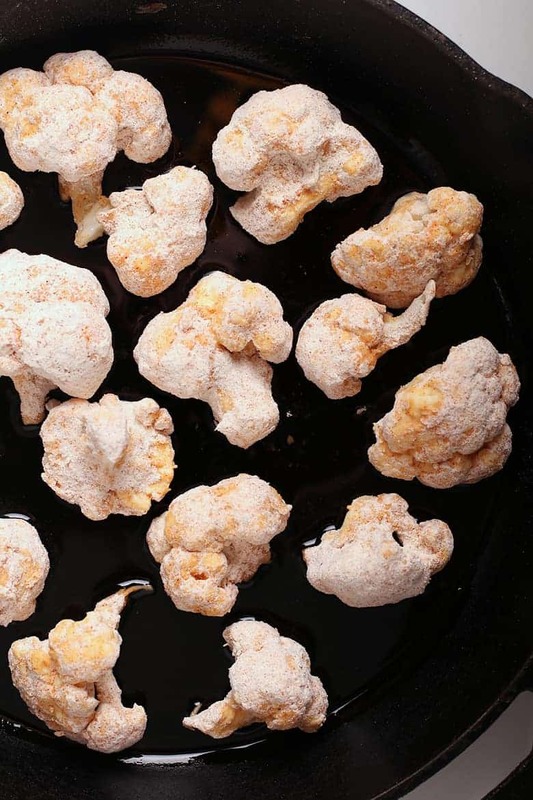 Crispy cauliflower has now been buzzing around for a handful of years. 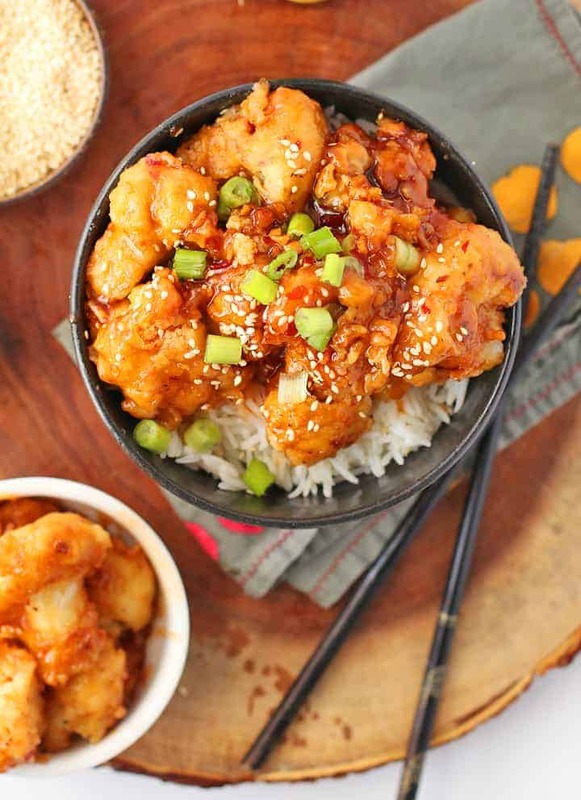 Replacing soy, it’s becoming a popular vegan alternative to Chicken Wings as well as fried chicken dishes, such as this Sticky Sesame Cauliflower. Not only does cauliflower provide healthier, whole food options for these comfort foods, it will also absorb any flavor you give it. Think Buffalo Cauliflower Wings, Orange Cauliflower, and Sweet and Sour Cauliflower, etc. Beyond that, the texture is out of this world. With a crispy battered shell and a melt-in-your-mouth buttery inside, crispy cauliflower is a game-changer. First, the cauliflower gets broken into bite-sized floret and battered. 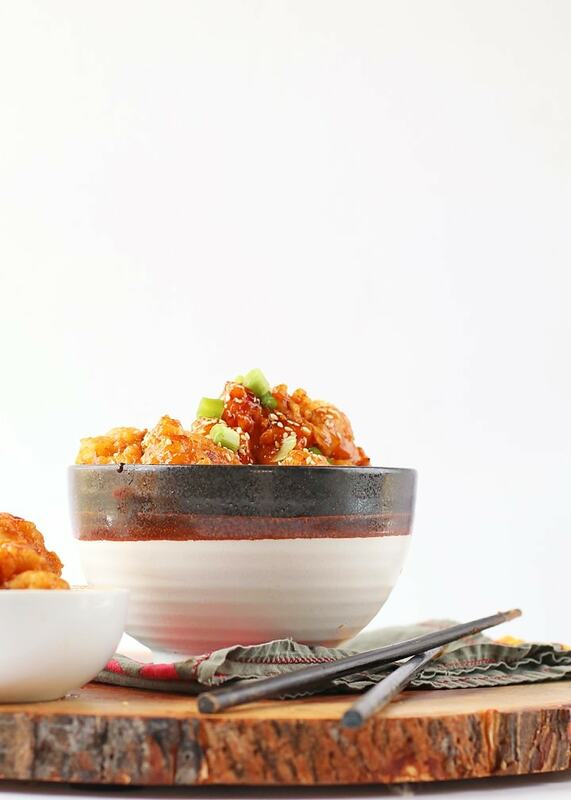 The batter for this sticky sesame cauliflower is broken down into two parts. First, we need an egg-like custard to coat the cauliflower in a thick gooey layer. This first step allows the flour mixture to better adhere to the cauliflower which creates the crispy skin. Through trial and error, I have found that equal parts water and chickpea flour make the best custard for this orange cauliflower. The custard is similar in texture to eggs and because it is high in protein, binds the flour to the florets thoroughly and evenly. While the cauliflower bakes, it’s time to make the sauce. This is a spin on a classic sticky sesame sauce but, to fit with the rest of this dish, I tried to make it just a little healthier. Sticky Sesame Sauce is traditionally made with brown sugar, but in this case, I used maple syrup. 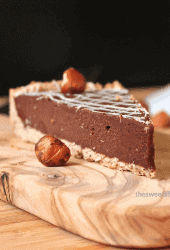 This not only cuts out the refined sugar but reduces the amount of overall sweetener. 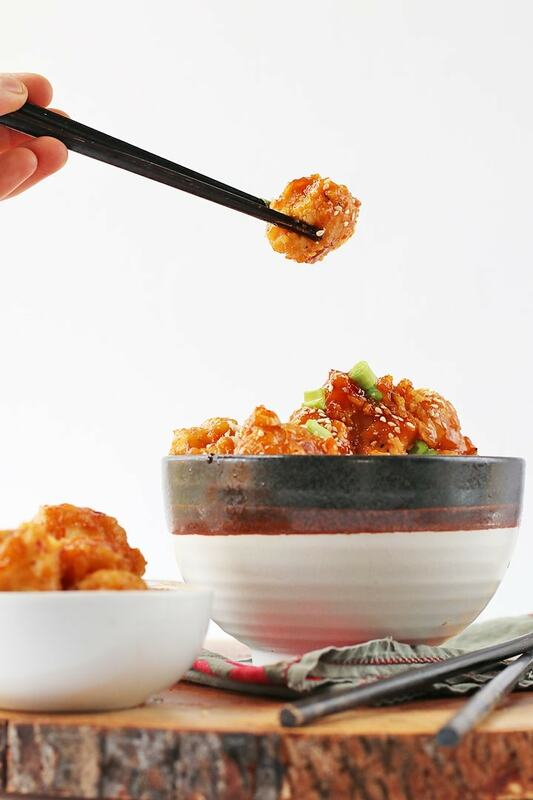 Mixed with sesame oil, rice vinegar, sweet chili sauce, fresh ginger, and garlic, you’ll get a sweet, sesame-y, spicy, and sticky sauce that is so good you’ll want to lick the bowl clean. Note that the sauce gets thickened with cornstarch while cooking. This is an important step that is not in the Sticky Sesame Cauliflower which naturally thickens as it cooks. Can the cauliflower be cooked in an air fryer? Why, yes! 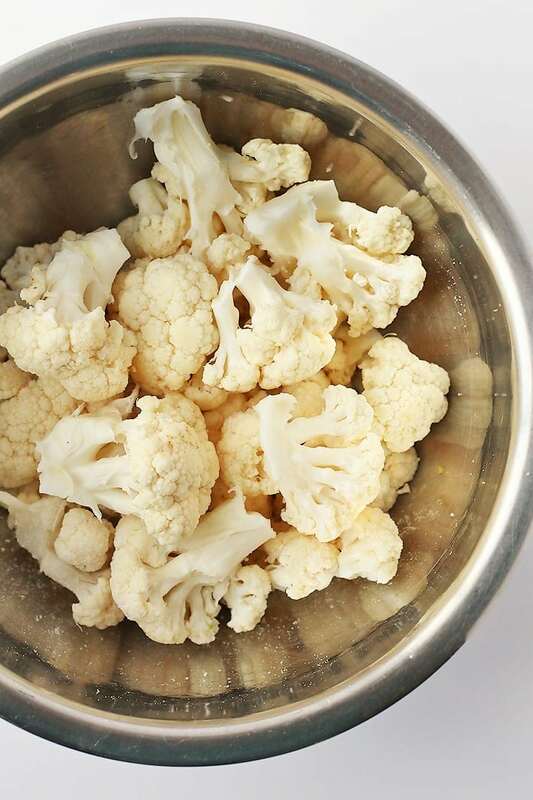 If you want to try air frying this Sticky Sesame Cauliflower, follow these instructions to cook your cauliflower in the air fryer. I didn’t use an air fryer for this recipe because I wanted to make it more accessible to everyone, but I have had great results with air-fried cauliflower wings with that method. Can these Cauliflower Wings be Gluten-Free? Yes. For those of you who are gluten-free, I have had luck using this 1:1 gluten-free flour blend for the breading of the cauliflower wings. 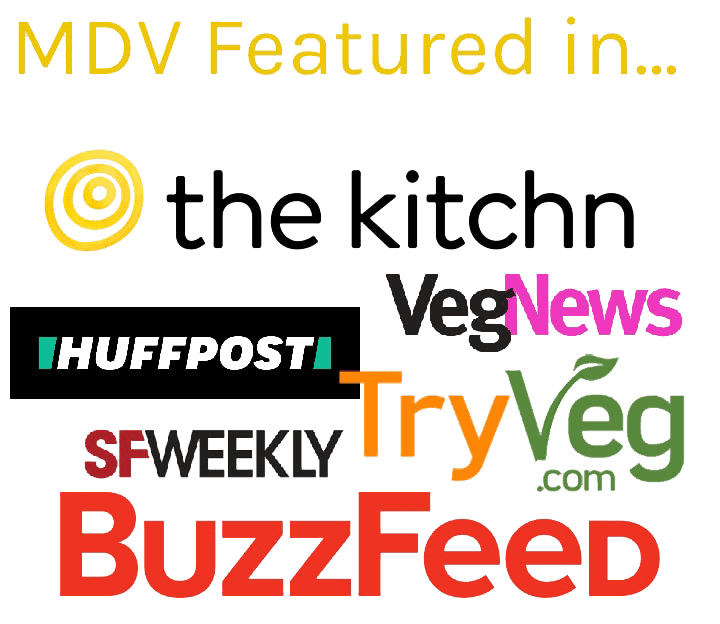 If you try other flour alternatives, please let us know how it goes! Serve the Sticky Cauliflower over rice with green onions and sesame seeds. You could also serve these cauliflower wings in a salad over Romaine lettuce. Unfortunately, this Sticky Sesame Cauliflower does not store well. They should be eaten the same day to avoid them from getting soggy. So stay in tonight. Open a bottle of wine. Start a fire. And make take-out with this healthier spin on classic Chinese comfort food. Begin by cooking the rice according to the rice package instructions. While rice is cooking, prepare your cauliflower. Preheat oven to 450 F. In a shallow mixing bowl, combine chickpea flour and water, whisking together until thick and gooey. This will act as your binder between the cauliflower and flour mixture. In a separate shallow bowl combine flour, salt, pepper, and garlic powder. 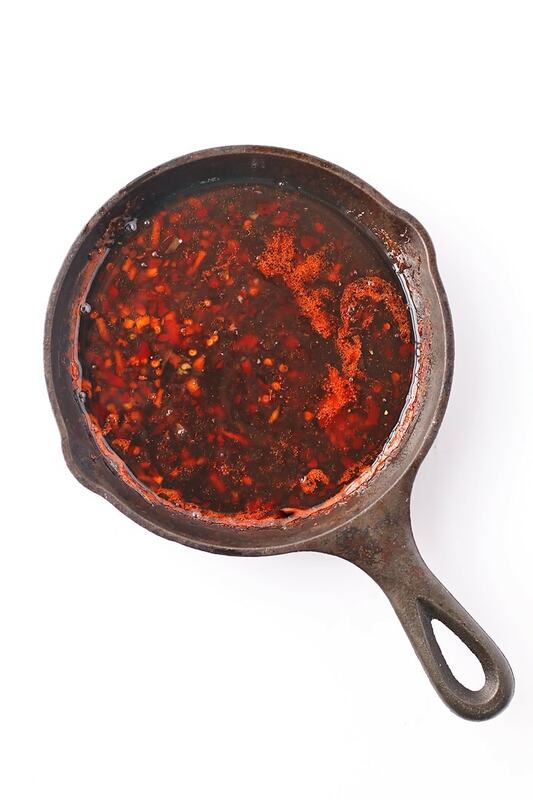 Pour 1 tbsp of cooking oil into a heavy bottom baking dish or large cast iron skillet. Dip each floret into the chickpea flour mixture until completely submerged, then dip it immediately into the flour mixture, coating thoroughly. Place the battered cauliflower in the baking dish and repeat until all the cauliflower is covered. Bake for 10 minutes. 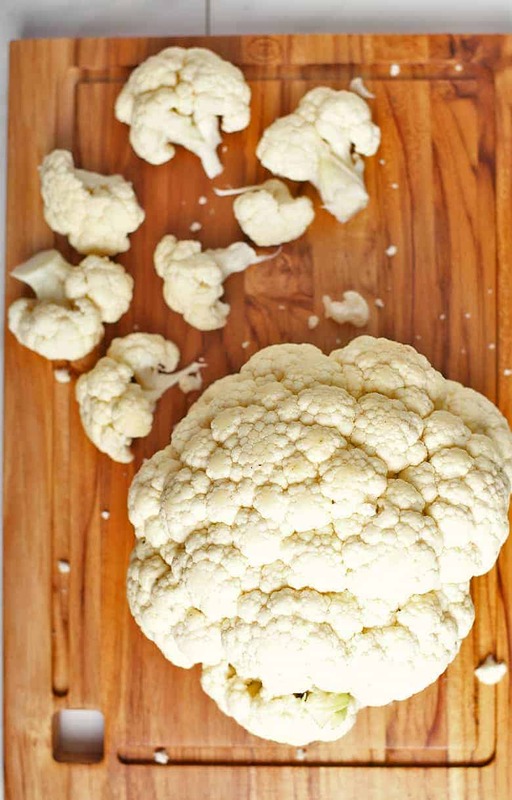 Pull out of the oven, flip cauliflower over and brush or spray the additional 1 tbsp of oil on the top of the florets. Bake for another 10 minutes. While cauliflower is baking, make your sauce. Begin by heating up sesame oil in a small pan. Add garlic and ginger and sauté for 1-2 minutes until fragrant. Whisk in remaining ingredients and simmer for 5 minutes. Pour all but 2 tbsp of sauce over the battered cauliflower and bake for another 5-10 minutes until sauce is sticky and thick. Serve immediately over cooked rice. Top with sesame seeds, green onion, and remaining 2 tbsp of sauce. 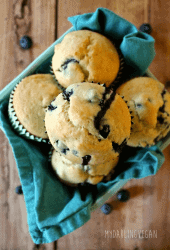 Hi, will it be okay to substitute chickpea flour with tapioca flour? I have never tried it this way but it might work as we just need the flour/water mixture to work as a binder. If you give it a try, let us know how it goes! How does the fat get so high? There’s two tablespoons of oil in the entire recipe. Also the sodium content makes me think about the amount in regular take-out! It comes from the 3 tbs of oil – each have about 14 grams. But, none only about 12 grams of it (6 grams each) is saturated. Coconut aminos could cut some of the sodium. Do you think the cauliflower can be cooked in an air fryer instead of oven? I tried it and didn’t have great results but I know other people have done this and it works quite well for them. I just haven’t figured out how to master the air fryer yet 🙂 If you give it a try, let us know how it goes. I love to go visit my son in LA and always make him take me to a Veggie Grill. Their sweet potato fries are to die for. Looks great. Has anyone tried lemon juice in place of the rice vinegar? I just made this and although it wasn’t as pretty as yours it tasted great. Thanks for sharing the recipe. This recipe is perfect! I love the sticky sauce. I sure miss your podcast episodes! I am hoping for new ones. ?? Going to try this tomorrow! Sounds amazing!!! Thanks! Thank you. I had to pause the podcast for the time being, unfortunately. Oh man does this look amazing} I can’t wait to make it! I love cauliflower recipes, and this sauce sounds incredible. Veggie Grill is one of our favorite places to go when we’re in LA. We live north of LA, there aren’t any within a close drive! Veggie Grill is so good, isn’t it! ?